Juicing has been around for decades. Slow juicing is becoming more popular, and a large number of juicer models with lower rpm are coming on the market. Compared to traditional juicers , which operate at about 3,500 rpm to more than 10,000 slow juicer operate 80 to 200 rpm. Slow juicers, also known as masticating juicers, are sure to get plenty of use. You will enjoy your juicing experience more than ever before plus great health benefits and even tastier juices. Slow juicing produces more nutritious drinks. There are a ton of different juicers to choose from, and some are better than others. We have chosen the best for you in our guide. While you can’t go wrong with either of these choices, there are a couple of differences you should be aware of when making your decision. The horizontal versions allow you more versatility since these types are those that can make nut butters, baby foods and more. The vertical variety cannot necessarily undertake these functions as well. The horizontal runs a little slower than vertical since gravity works along with the vertical models. Vertical models will also require less space on your countertop than a horizontal version, so if you are short on kitchen space this should be taken into consideration. The auger refers to the gears within the juicer. If you have a single auger slow juicer, it will obviously juice at a slower pace than a double auger juicer. However, this option will be reflected in the price point. Single auger style will handle smaller loads than a double auger slow juicer as well. Some slow juicers are only made with one speed setting, while others are available with two or more. These ones are great for getting through fruits or tougher skins. The slower speeds are great for vegetables and leafy greens. If you can, it is best to find a slow juicer with dual speeds at the minimum. The Omega Nutrition Center is a versatile, powerful slow juicer. It features an automatic pulp ejector system to prevent clogging and allow continuous use. It is a very versatile machine with the capability to make nut butters, baby food, sorbets and even grind coffee. This Juicer runs at 80 rpm which is great for slow juicers. If you want a juicer to match your décor, these are available in multiple color selections. This vertical, stylish slow juicer boasts a large 3-inch chute opening which means less cutting or chopping for you. Fruits and vegetables will fit easily through the wide opening, without much fuss. 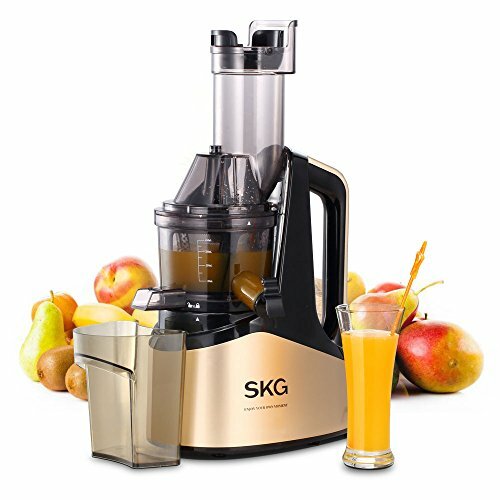 The SKG juicer runs at a very low speed, allowing all the important nutrients and minerals to stay in tact within your juices. It is a versatile juicer with stainless steel and silicone parts for longer life. 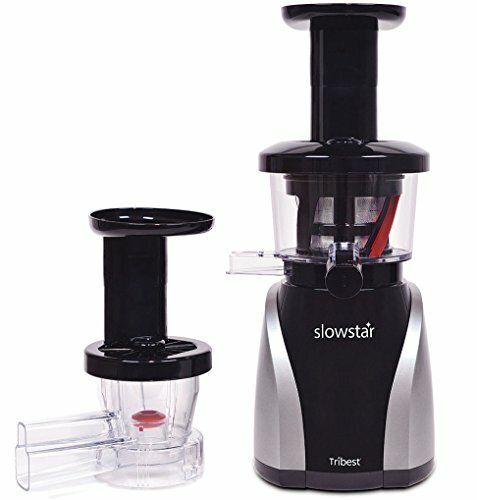 The Tribest Slowstar is versatile machine which offers more than just delicious juices. This model comes with an included mincer, perfect for garlic and other herbs plus so much more. It runs at 47 rpm for a truly slow juicing affect, to get the most nutrients possible from your fruits and veggies. It boasts a dual auger system for more efficiency in bigger loads. This juicer comes with a juice cap, which allows you to switch containers if you need to during the juicing process without making a mess. 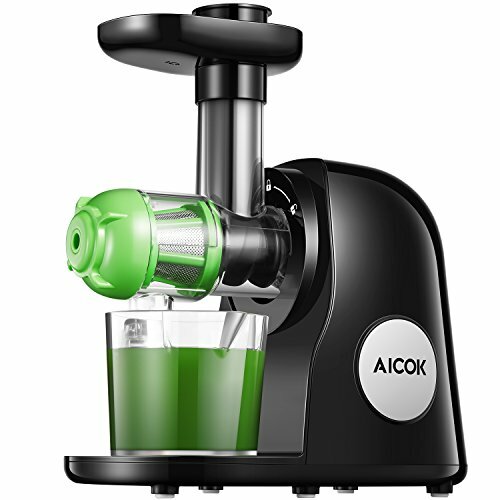 The Aicok Slow Juicer is a horizontal style appliance which runs at about 80rpm, for slow, steady juicing. It has an automatic pulp ejection system to allow you to continuously juice without stopping to empty a pulp chamber. The machine also features a reverse function to prevent clogging up the machine. For a horizontal model, it doesn’t take up too much space and runs quietly too. This vertical juicer takes up a very small amount of space and yet has great power. The extra wide food chute is large enough to accommodate some whole fruits and vegetables which means less work for you. The pulp is automatically ejected, reducing the need to clear out built up pulp. 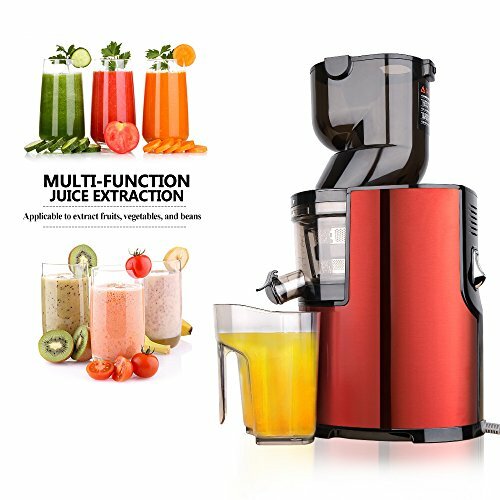 It features a quiet operation at 60 RPM for retention of nutrients and minerals in your juices. While all the top 5 best slow juicer machines outlined here are great appliances, there is one that stands out above the rest, in my opinion. If I were to choose one for my home, it would have to be the Omega Nutrition Center Juicer since it ticks off so many boxes in features and functions. 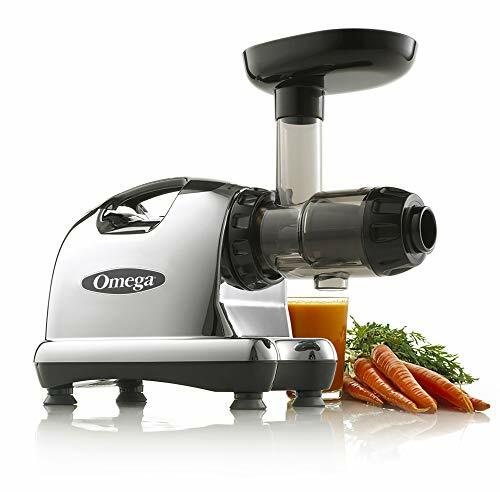 The Omega offers many different functions aside from slow juicing, which means it gets more use in the kitchen. You can create nut butters, baby food, sorbets and so much more. Having the 80 RPM speed means it runs perfectly as a slow juicer but outputs your juices in a timely manner. The machine is also available in many fun, stylish colors to match your kitchen and preferences. The mid-range price point is perfect for anyone looking to start in juicing as well as seasoned veterans. You can make juices or whatever whenever you wish and you won’t disturb the household since it features a quiet operation. Hopefully this guide to the top 5 best slow juicer appliances has been helpful in making your decision as to which one to buy. Please leave a comment or question since we love hearing from you! Why a Slow Juicer over Centrifugal Juicer? There are many differences when it comes to slow juicers versus centrifugal juicers. These differences will help you decide that slow juicing is a more beneficial way to make your home juice recipes. Here we will explore those differences so you can see for yourself exactly what you are purchasing. Since the word “slow” is in the name slow juicer, it is probably obvious that slow juicers run at a slower speed than centrifugal juicers. You can usually expect a slow juicer to run at 80 to 90 RPM whereas a centrifugal juicer runs between 1000 to 24,000 RPM. This does mean that a centrifugal juicer will turn out the juices it creates faster than a slow juicer, but there are other benefits to a slow juicer despite it’s slower process. Running at a slower RPM means oxidation and separation is eliminated. A centrifugal juicer takes whole fruit and vegetables down it’s tube to a sharp blade where the fruit and vegetable is sliced while the pulp is separated into a different compartment and the juice is output. In slow juicers, fruits and vegetables are pressed which preserves their overall make up, and gives you more of the nutrients contained inside. The pulp left behind is much drier than a centrifugal juicer which means you get more juice to enjoy. To put it simply, centrifugal juicers use up to 1500 watts of energy, whereas slow juicers require about 200 watts. With the rising cost of home heating and energy bills, this savings will surely be appreciated. Oxidation happens when the juice is exposed to higher temperatures during the juicing process. This happens with centrifugal juicers because of the higher speed they operate at. The juices will begin to oxidize and thus only have a shelf life (in the refrigerator) or about 5 to 8 hours. A slow juicer does not create heat during it’s process since it runs slower. This save from the oxidization process happening to the juices, and means its juices can be kept safely in the fridge from 48 to 72 hours. With a slow juicer, you will yield far more juice than with a centrifugal juicer. The pressing process allows more juice to be extracted and pulp removed. This means over the long haul, you will save money on your produce bill since you will require less fruits or vegetables to make your juices. With a slow juicer, you will be able to juice many more things than a centrifugal juicer. Wheatgrass can be easily juiced with a slow juicer, whereas not so much in a “fast” juicer. Other items include kale, spinach and other dark, leafy greens. The centrifugal juicers chop these items into little bits, barely extracting any juices at all. But since slow juicers use a pressing function to extract juice, the yield is much higher for these foods. Any juicer will require some clean up, so that really shouldn’t be a factor, however, cleaning up a slow juicer is a little safer. There is no sharp, serrated blade to worry about, therefore cleaning a slow juicer can be done by anyone. No need to worry about cutting yourself. In general, slow juicers are easier and faster to clean up with less parts. If you are looking for a multi-functional juicer, then a slow juicer is a great option. They usually include different attachments which allow you to make nut butters, baby foods, or even tasty sorbet. With a centrifuge system, these options are not possible.